Trucks and Cities Are Like Oil and Water. Is There a Solution? About 350 pedestrians, cyclists and motorcyclists are killed each year by large trucks in this country. Big freight trucks are incompatible with cities in many ways, bringing danger, pollution, noise, and traffic congestion. They park in bike lanes and have shockingly big blind spots, putting everyone around them at risk. And yet, most cities haven’t found a way to reconcile the need to move goods with all their other priorities. Meanwhile, as more and more cities prioritize walkability and bike-friendliness, they often neglect the task of reconfiguring freight logistics. As part of the MAP-21 transportation bill, U.S. DOT convened a Freight Advisory Committee to help inform the creation of a national strategic plan for freight transportation. One of the advisory panel’s six subcommittees focuses on the first mile/last mile problem, but even that one subcommittee is reportedly more concerned with port access than delivery issues at the destination. 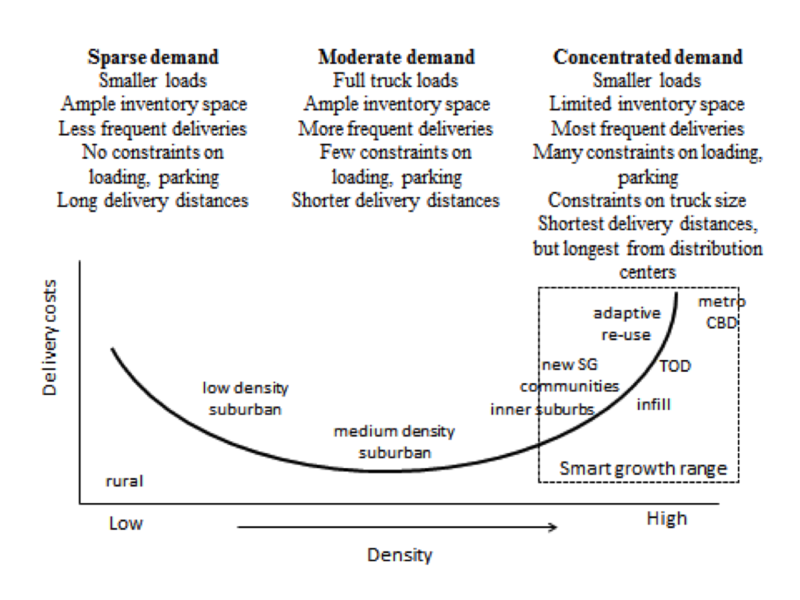 The interplay between urban freight transportation and smart growth is far from a core focus of the committee. It should be a top priority for urbanists and complete streets advocates, though. If we don’t help cities plan for freight movement, what we’ll get is unplanned freight movement, and all the chaos that comes with it. About 80 percent of freight in cities is delivered by trucks, and those trucks pose a significant threat to livability. Loading and unloading slows traffic and takes up street space. When businesses do have dedicated loading docks, they reduce available space for the business and for the pedestrian activity that enlivens urban spaces. Then there’s noise pollution, air pollution, and safety concerns. Suburbs are paradise for freight companies. Density is high enough that they can fill their trucks to the brim but low enough that roads are big and wide and parking lots stretch to the horizon. Destinations are close enough together that trucks can make multiple deliveries, and distribution warehouses tend to be located in suburbs. But according to Genevieve Giuliano, a member of the national Freight Advisory Committee and the nation’s top expert on urban goods movement, everything there is to love about cities is everything that makes freight movement hard. Land values are high. Everybody’s fighting for scarce street space. Big trucks can’t fit around all the tight corners. Stores have a smaller footprint, and less storage space means more frequent deliveries. And the distribution center is 40 miles away. That sentiment is echoed by SUNY-Buffalo Professor Qian Wang, who is presiding over an urban freight session at the annual Transportation Research Board meeting next week, in which dozens of researchers will present their work on the issue. FedEx and UPS notoriously pay cities millions a year in parking tickets, considering it a necessary cost of doing business. Often, rather than pay each individual ticket, they negotiate a lump sum with the city, removing the incentive for drivers to park legally. The fact is those cities have never come up with a realistic plan for how to supply the stores, restaurants, and offices that make them tick. So double-parking has, essentially, become a foundation of our nation’s unsustainable freight strategy. Giuliano — a member of a federally-convened national committee on freight, mind you — isn’t so convinced that any of this is really a federal issue. There’s a lot cities can’t control when it comes to freight — the fact that you eat out every day instead of subsisting purely off your rooftop garden, for example, resulting in the need to stock restaurants with all your favorite imported beers and off-season produce. But cities can control some things, and Giuliano says they should probably be the ones taking leadership here. It’s unlikely a single city street will be designated part of the official, 27,000-mile national freight network that U.S. DOT is also currently tasked with coming up with — after all, there are 47,000 miles of interstate vying for the title — but cities can designate their streets as truck routes. Unfortunately, many cities haven’t done a great job of establishing truck routes, and there’s little to no public data about where trucks go once they leave the port, so there’s not much to work with. But Wang says freight companies have excellent data on the movement of their trucks; they just don’t share it readily with academics or city planners. Giuliano said truck route enforcement in many cities is quite robust, and truckers are far more sensitive to moving violations than parking violations. But as Wang notes, every mode is jockeying for space on “truck routes” too. Off-peak delivery times. Though this can create noise pollution in residential areas in the dead of night, bringing trucks into the city during low-congestion times makes a lot of sense. However, as Giuliano said, that means someone either needs to be at the store (getting paid time-and-a-half during a time there’s usually no one on the clock) to receive the shipment, or they need to trust the distributor that everything will go perfectly without supervision. Variable road pricing, more expensive at peak times, also helps to incentivize trucking companies to delivery at off-hours but doesn’t do anything to entice the receivers. Load consolidation. It can be hard for competing suppliers to cooperate, but when they group their goods together on one truck, it can make for fewer trips — though it can also make for bigger trucks. Cargo bikes! The European Union has a project to study ways to move freight to modes with fewer negative externalities than trucking. The project, called Cycle Logistics, has estimated that 42 percent of urban freight could go on bikes instead of trucks. A Boston-area company, Metro Pedal Power, uses pedal-trucks to haul up to 500 pounds of localized freight. Again, it’s a lot of load-shifting and a whole lot more labor costs, but wow — I want to live in the city that has 42 percent of its freight delivered by bike. At the very least, you’d have some ripped delivery men. Presumably a ramp and dolly would work, as is done with trucks now. I don’t see a major problem with pulling over into a designated siding and making cargo deliveries on a given block by foot with that system, even. It’s probably preferable to driving a smaller truck back to a warehouse or freight transfer facility. I think that the biggest issue is the size of trucks performing right turns. Double parking in bike lanes is irritating but less of a safety issue. There has been a trend towards bigger is better and behemoth is best, but not for bicyclist and walker safety. Same with emergency vehicles that present as much danger as the emergencies they are responding to. Smaller vehicles! A truck sitting still only costs the company the money they could potentially make if it was moving – MOST drivers of OTR trucks are paid by the mile not the hour. Many of these drivers get no extra pay for loading and unloading, even when they have to do it themselves. You can keep saying it, and keep being wrong. For $1B/mile, you can have a subway tunnel. Tracks and catenary cost in the mid-to-high millions on greenfield ROWs and maybe tens of millions on existing streets. And if Jews really objected to cargo trams, couldn’t they just keep using trucks? There is nothing mutually exclusive about this. You have no conception of costs, do you? Greenfield HSR in first world countries costs maybe $20M/mile. Expensive, yes, but hardly unaffordable and usually profitable when it goes into operation. I agree. I took this picture yesterday in central San Francisco only one block from where a pedestrian was recently killed by a turning truck. That kind of truck is driven in America because American truck drivers are macho dumbasses. It has no other reason to exist. In civilized places, truck drivers drive civilized trucks. I particular, these trucks can negotiate city corners and give the driver a good field of vision with fewer blind spots. I’d wager that you’re not a daily city cyclist. Rail to trike. Boat to trike. NYC has all the old infrastructure to execute – just not the balls. Revolutionrickshaws.com is doing it anyway. Join Revolution? 100 yrs ago Manhattan was denser than today – and giant motor vehicles didn’t exist. Go figure. We can “look” to the Feds to impost real costs of infrastructure upkeep on giant motor tractor trailers with our tax dollars for one thing, yes. What if massive Fed subsidies went to infrastructure that favored sail, rail, and trikes instead of semi tractor trailers for freight. We’d have different overall housing and enterprise development patterns in cities and the sticks, too. Feds don’t want that – trust me. Best to get Feds out of the extortion and reapportion game in any way possible. Subsidies for rail have been with us since before Lincoln’s war. Subsidies for water ways even longer. But since you don’t like fed subsidies, how about having the federal government stop raiding transportation fuel taxes for bike lanes and transit? I’m going to gather most here won’t like that one bit. That’s the political game, taxing other people for what one wants. To use the government’s monopoly on legal violence to one’s own benefit at the cost of someone else. Perhaps the best thing to do would move towards a voluntary society where people simply paid their own way? Mike, I run a city logistics company leveraging exclusively freight trikes for operations here in NYC. Context and framing the issue is everything, of course. I watch dudes in 53ft semi tractor trailers clog midtown traffic double and triple parking every rush hr here (not to mention their sheer heft in the streets as problem installations) to drop dozens of tons of “food” to enterprises. My freight trikes move a few hundred pounds per run before we return to the hub to reload. Obviously, to match the absurd capacity of these motorized menaces, the labor costs of a company leveraging freight trikes will be higher versus those of toxic tractor trailers VMT. It’s the awe-inspiring infrastructure subsidies that enable these trucks to compete and even handily beat our pricing. That noted, on certain routes we can compete today. If anyone would bother to invest/subsidize trike tech, we’d be delivering billions of lbs of produce and products annually in NYC alone. This is not to mention supply chains that incorporate freight trikes into their systems from start to finish as possibly the core issue. It’s all coming, just much slower than need be. 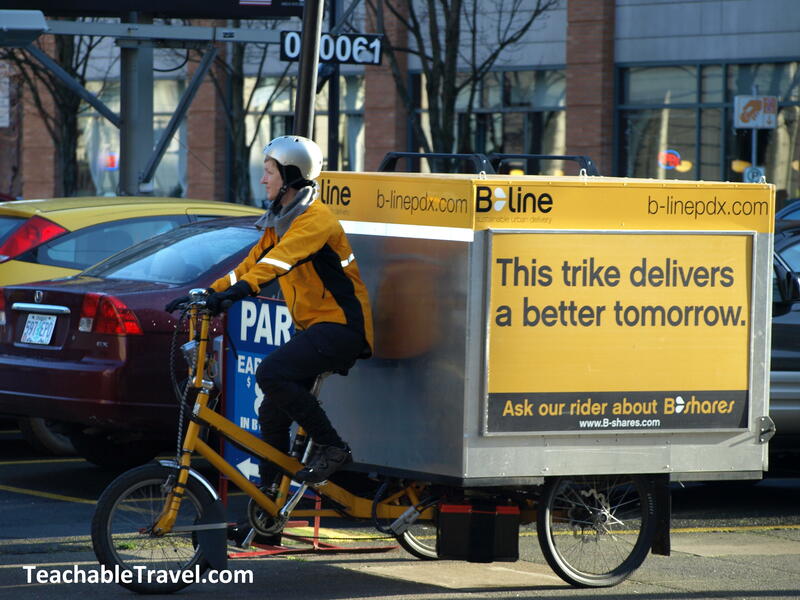 BTW, I got B-Line (and Metro Pedal Power) their very first trikes via Cycles Maximus as its US agent. Ironically, we in NYC are not allowed by law to operate these motorized trikes – another barrier to overcome. You wager wrong. I am. But I’m also a vehicular cyclist who leaves the bike lane any time it is not the safest lane to use, which is often, and that means I’m often already out in the travel lane before I come to double-parked vehicles. I can easily protect myself by choosing where to travel on the roadway, but it is harder to protect myself against right turning trucks. So you back the double parking menace because you manage. Congrats. I’ll happily buy you a drink in NYC. Love it, ooo. In fact, let’s eliminate the Federal government altogether. You on board? Perhaps state or even city-state governments in which citizens simply paid their own way for management of their land would do the trick. I’m going to gather that you wouldn’t like that one bit? Lincoln helped to cause this mess, indeed. Ready to back out of it with us? If we want a peaceful voluntary society, the conflict that results from government’s monopoly on legal violence must end. Every one is articulated, at the coupling between tractor and trailer. This gives 18 wheelers much greater turning efficiency than long “single unit” trucks of similar overall length. 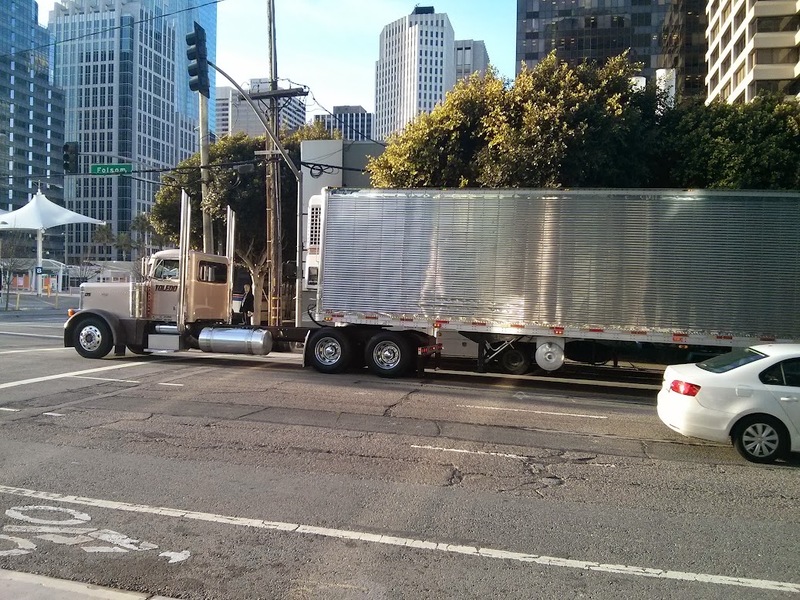 Consider, for example, the Urban delivery capabilities of short trailer semis of approximately 35 feet. If you go back to my original comment, I did not “back” double parking, just said it is not as big an issue. 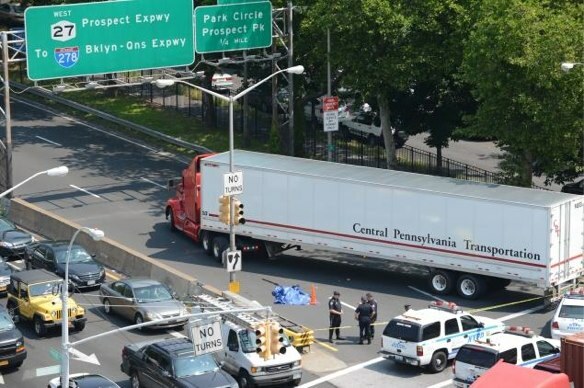 If you are from NYC, then you probably are aware of the large number of bicyclists and pedestrians who have been crushed by right turning trucks. Overtaking crashes, some caused by double-parking, are less common but not unimportant. NYC DOT offers statistics on number of crashes/fatalities in the boroughs, but I didn’t find causes. Perusing Streetsblog NYC, though, gives me the impression that right turns are the big issue, and much more likely to result in fatalities. And back then a huge number of people were killed by horse carts. This isn’t a new problem. I mean why can’t we use two 26.5-foot semi trailers, with a flexible connection in the middle, rather than one 53-foot one? Also by people operating rail cars – inspiration for the name Brooklyn Dodgers! Don’t know about the horse cart angle as much? You seem more familiar. Difference is that the infrastructure grab by semi-tractor trailer infrastructure lately is at a level unrivaled by any other – and it’s almost all maintained by the federal (and to a lesser amount state and local) governments as opposed to private enterprise. Standard shipping container sizes, maybe? Dunno. These used to exist, basically. Turns out rail requires high volumne and most stores don’t get high volumes of deliveries. That’s fantasy. Someone has to stop thugs from running multiple competing private extortion gangs, and whoever does stop them…. becomes the government. As long as there are would-be thugs, government is *unavoidable*. That’s the first step to a better world, to realize the true nature of government, thuggery. The next step is to make the moral decision not use government to take from others for yourself or those you want to help. We’re not much of a nation, to be honest. Most of us pay a 100-year-old confiscatory war tax aka “personal income tax” to the Feds (which enables the ridiculous semi-tractor-trailer aka military focused infrastructure to be maintained and expanded) with nary a peep. For the first 140 or so years of the existence of this nation, the only time such a tax reared its ugly head was for the purpose of enabling Lincoln to prosecute his war on the states in the South; that tax ended soon after the South, states rights, and slavery among other things were scuttled. The war tax returned in 1914, ostensibly for Wilson to fund his war desires – and it never ended. The Feds have been prosecuting a war on ourselves, our land, and our resources (and others, of course) going on 100 years straight now. It’s much worse than whining, Jack. Water coolers are a great investment either at home or in the office. You can now get two in one water dispensers the hot and cold water dispensers Visit our website to get more details. Can trucks have sensors that will alert them when someone is in the blind spot. The DOT is installing side guards on its trucks to reduce the risk of fatal collisions with people walking and biking. Some strategies to make large vehicles safer in urban environments and save lives.